Few young musicians truly find success when they spread their wings in the Big Apple. That Twin Cities native trumpeter John Raymond found plenty of work as a sideman and leader within a few years of his graduation from the University of Wisconsin-Eau Claire is in part testimony to his artistic talent, in part to his tenacity in marketing his music. Both have served him well on the New York scene: In addition to completing his master's degree under Jon Faddis at SUNY-Purchase, Raymond has gigged regularly with his own ensembles throughout the Manhattan club circuit and on national tours; participated in the renowned Festival of New Trumpet; received the 2015 Herb Alpert Young Composer Award; and released a well-received recording on Fresh Sound/New Talent, featuring the great drummer, Billy Hart (Foreign Territory, 2015). Fortunately for Twin Cities' audiences, John returns "home" often, and on one of those visits in fall 2014, he performed at Studio Z with what he then called his Roots Trio (with guitarist Gilad Hekselman and drummer Colin Stranahan). Shortly thereafter, the trio went into Terrarium Studios in Minneapolis to lay down the tracks that became Real Feels, to be officially released in February on the Twin Cities label, Shifting Paradigm Records. 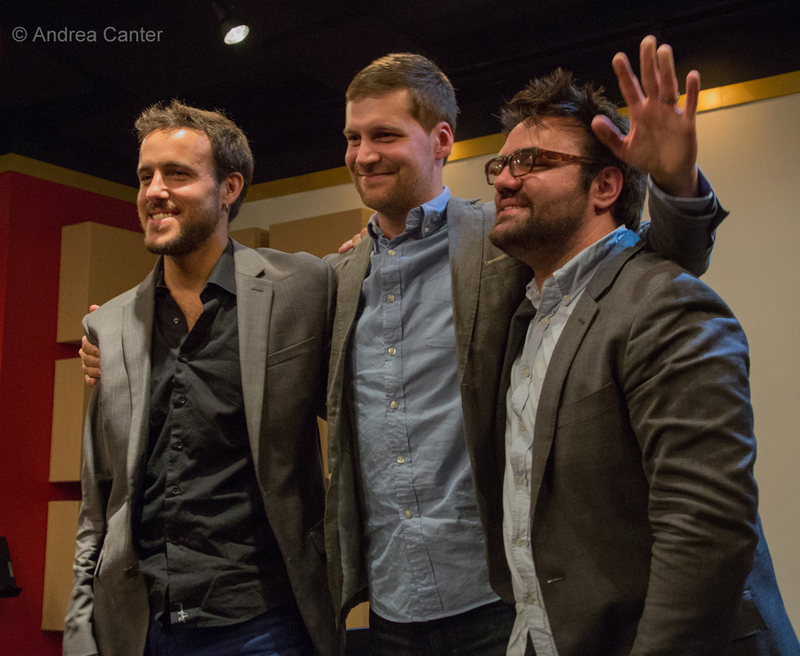 Prior to the trio's New York release (Cornelia Street Cafe on February 11), they're celebrating on a mostly Midwest tour, landing in St. Paul at Vieux Carré on Saturday, January 23 (9 pm), followed by a master class at MacPhail Center for Music on January 24 (1 pm). From "Roots" to "Real Feels"
Real Feels is a unique project on several levels. For the first time, John relies solely on the flugelhorn. 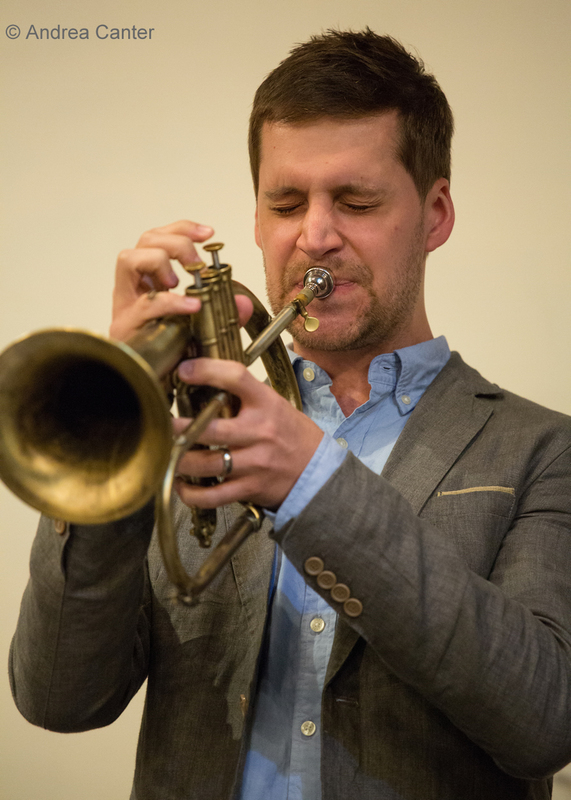 "I’ve transitioned to only playing flugelhorn with the trio," he told Bebopified's Pamela Espeland before the Roots Trio gig in St. Paul. "I think it sounds great with guitar. That comes out of the Art Farmer/Jim Hall influence. Farmer is one of the only people who’s known for playing mainly flugelhorn. 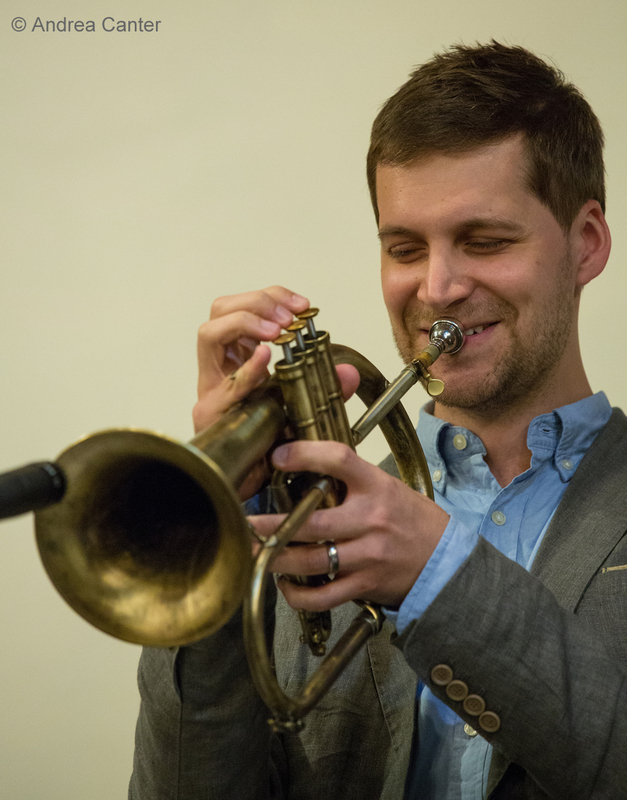 I got a new flugelhorn, and there’s something about it and just playing flugel in general that has brought out a voice in me that I didn’t have playing trumpet." The trio instrumentation is unusual --just flugelhorn, guitar and drums, somewhat akin to the Paul Motian/Joe Lovano/Bill Frisell Trio. "The bass-less vibe is very unique,” says Raymond. “Gilad is one of the only people I know that function so effortlessly in a situation like this. In a sense I’ve given him all control of the harmony, comping, and different textures, and I feel that he really thrives in this setting.” An Israeli native, guitarist Gilad Hekselman has developed a stellar reputation over his first decade in New York, winning the 2005 Gibson Montreux International Guitar Competition, releasing four recordings as leader, and sharing the stage with such notables as Chris Potter, Mark Turner, John Scofield, Anat Cohen, Ari Hoenig, Esperanza Spalding, Gretchen Parlato, Jeff 'Tain' Watts and more. 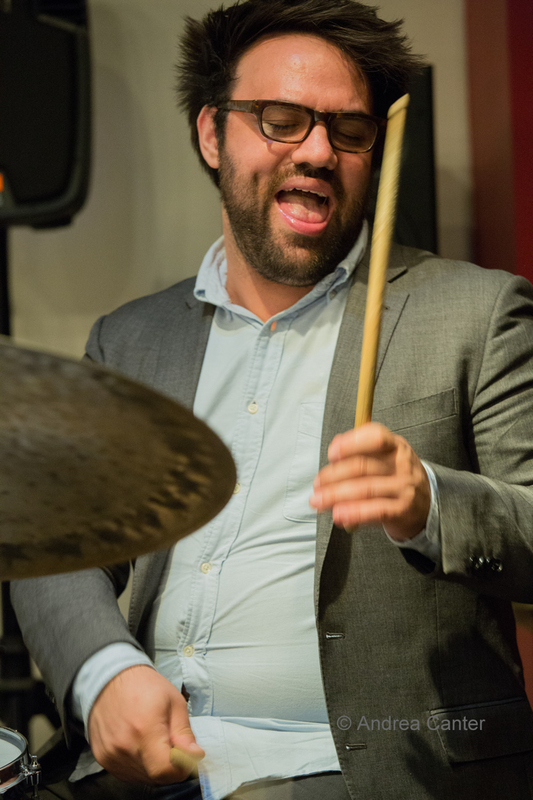 Denver native Colin Stranahan was selected as a Brubeck Fellow after high school graduation and as a participant in Betty Carter's Jazz Ahead program, and in 2012 placed third in the Thelonious Monk International Drum Competition. Notes Raymond, "Colin was someone that I played a handful of sessions with before doing some gigs together. He's got such a natural feeling for the music - amazing instincts and he's always really in-the-moment. He brings a sense of unpredictability to this band - in the best kind of way." Also setting this album apart from many of its contemporaries is the setlist, which reflects the original trio name "Roots," connecting Americana folk (Woody Guthrie's "This Land Is Your Land", the Appalachian hymn "Amazing Grace"), traditional English balladry via modern American rock ("Scarborough Fair"), and American gospel (I'll Fly Away") to classic bebop (Charlie Parker's "Donna Lee"), pop (Lennon and McCartney's "Blackbird"), alternative rock (Thom Yorke's "Atoms for Peace) and modern jazz (Dave Holland's nod to Charles Mingus, "Blues for CM"); John provides one original track, the opening "Thaddeus." This might seem to be a step back as Raymond's first two recordings provided more original material. But, he says, "I thought, let’s just scrap the whole originals thing. Let’s play songs that people are familiar with, whether that’s folk songs or hymns or indie rock tunes, and incorporate some standards in there, too." 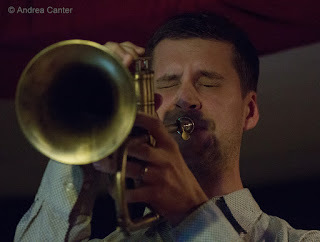 And he is not concerned that much of the setlist comes from places other than jazz, noting that "the nature of the instrumentation, specifically flugelhorn and guitar, will lend a rootsy feel to things, for lack of a better word, so I’m not as concerned about squeezing the jazz out of it." 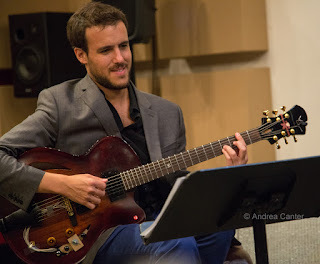 And the familiarity of most of the material has allowed the musicians to make a more direct connection with the audience. “I’ve really sensed a different connection with audiences when playing this music with this band," says John. "It’s coming from such a genuine place for all of us that I think it really connects with people in a profound way. That’s precisely why I named the band Real Feels." Still, a "unique" project is only memorable if well executed, and here the trio shines brightly. Without piano or bass, the music has a raw edge, providing a fresh immediacy regardless of the tune's origins in medieval England, Appalachia, bebop or contemporary rock. The one original, "Thaddeus," opens the set, Raymond noting that his tribute to Thad Jones is "based on his song 'Three and One,' so it’s a contrafact." 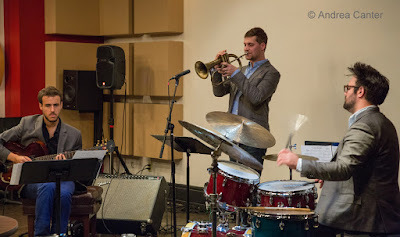 Spare with wide spaces, flugelhorn harmonizes with guitar, drawing energy from the splatter-patter of Stranahan's drums, the trio filling in spaces as they move along with some Monkish turns. The traditional gospel hymn "I'll Fly Away" gets a funky intro from Hekselman, feeling much like a march down Bourbon Street as it generates a lot of sound for three musicians. Hekselman particularly plays multiple roles, conjuring bass, banjo and guitar all at once, while Stranahan fills dual roles as well with bass drum/snare/cymbal action, and Raymond brings the flugelhorn to the higher end of sassy brass. In a different spiritual direction, "Amazing Grace" covers two tracks, the intro track a solo improv on flugelhorn that folds into a fairly straight reading before Hekselman's long guitar solo, creating an exquisite country prayer. The flugelhorn returns with an unmistakable call to church as the guitar mimics the church organ. On "Atoms for Peace," Hekselman appears to be using a looper to maintain what sounds like a bass vamp throughout the track, while also drawing ethereal effects from the guitar. The trio thus sounds like a quartet or quintet; Raymond's flugelhorn is elegant and haunting in the mode of modern European ensembles. Reaching back to Charlie Parker on "Donna Lee, the trio creates a sketchy, spartan feel to their conversation, particularly effective in the weaving of flugelhorn and guitar, maintaining the essence of Parker throughout their unique interpretation. "Scarborough Fair" nods to both American folk-rock (Simon and Garfunkel) and the traditional English song, yet wrapped in a modern jazz feel. Again the pairings of lines and harmonic statements from flugelhorn and guitar, and the underlying pacing from Stranahan (especially from the toms and cymbals), yields glorious understatement. As if from the other side of the Earth, Dave Holland's "Blues for CM" is given a swampy foundation via guitar and drums, like Mingus Meets Dave Torn. The intro to "This Land Is Your Land" doesn't give much hint of the tune. Raymond's whiney flugel, followed by agile twists from Hekselman, does not suggest "Redwood Forests" but perhaps more "New York Island," more rush hour traffic than majestic mountain trails! But the terrain is rugged and filled with ups and downs, twists and turns, and the final recall of the melody does indeed feel like home. The final track, "Blackbird" starts as a slow meander down a country lane or a float down a lazy stream. Graced by Stranahan's fluttery brushes and cymbals, it's sweeter, more nostaligic, than the original from Lennon and McCartney. "I think it captures exactly who this band was at the time," notes John. "It was pretty early on in the band's existence that we recorded this music, and so in a lot of ways I feel like we've really evolved and deepened in our chemistry with one another since we recorded it. I also feel like my vision and concept for the group has really developed since then, too..." As for the next step in his evolution and vision, John says, "I actually feel like both this and my last record [Foreign Territory] were both in the 'seed' stage, and thus I'm sensing the need to continue to grow each of them. I have tentative plans to record again with Billy, Dan and Joe [Hart, Tepfer, Martin] for another quartet record in May, and I'd like to record Real Feels again, maybe later in the year or early in 2017. But I'm definitely going to keep focused on these two projects primarily and see where they lead artistically and otherwise." 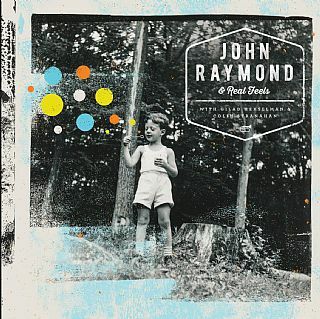 What unites these two directions is the creative searching of John Raymond as he moves from "foreign territory" into the music that feels "real" -- ideas that have solid roots in the musical traditions of the distant past as well as the broadly defined present, and all that adds up to a very bright future.